Are you in love with Tiny House Nation? The hit TV show has inspired thousands around the United States, and even around the globe, to take up a lifestyle of small space, mobile living. Expand Furniture has been featured in several episodes. Our revolutionary, space-saving furniture makes for ingenious tiny house living. We continue to be inspired by the tiny house application of our convertible and space-saving furniture. Tiny homes are very popular right now. People all over the world are moving into tiny homes as a way to conserve resources, reduce their impact on the environment, and give themselves more freedom. Not only are the houses usually mobile, but they have such low purchase and upkeep costs that people usually can work part-time or opt for lower pressure jobs to support themselves. Of course, living in a tiny home also means that you have far less space, and that can be a huge adjustment for people. However, with a little creative design and some multi-use furniture, people who live in tiny homes have found ways to make the space work for them so that they feel like they have everything they need. Tiny homes calculate ground square footage, not the vertical area. A lot of tiny homeowners get more out of the space by taking advantage of vertical square footage. Lofts are a staple of tiny home design, and they are most often used for the bedrooms in the home. You don’t have to have a loft built into your home to take advantage of vertical space. You can buy a loft system and add a loft area to any room in your home. 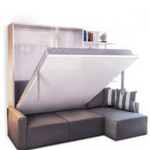 Use the loft system to elevate the bed in a room and make more space for toys or a study area. Use a loft system in a guest room to make space for a guest bed and still have room for your workout equipment or home office. There are many different ways you can use a loft to get more functionality out of the space you have. You don’t need a lot of closet space to get good storage and keep your home free of clutter. Tiny homeowners find ways to pack a lot of belongings into very small square footage by using everything they can as storage. 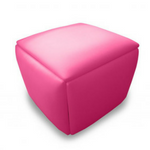 That means buying ottomans that can be used as chairs or foot stools and hold items inside. That means building cabinets or drawers into stairs or building storage under a couch or bench. You may have to do a little remodeling to get some of this storage, or you may just need to invest in different furniture. A bed takes up quite a lot of floor space, but it is really only used a third of the time. The rest of the time, it is just taking up room that you could be using for other things. Besides using lofts, tiny homeowners have solved the problem of the bed by using the wall bed. When the bed is not in use, it folds flat against the wall and is completely out of sight. Some designs combine the bed with a sofa or other elements. When you want to use the bed, you just pull the platform down over the couch. Shelves, a desk, and other items can also be included with a wall bed. You can also invest in a good sofa bed for your own sleeping area or for a guest room. Today’s sofa beds fold out with a much easier design than the sofa beds of old, and they have larger and more comfortable mattresses similar to what you would find in a bedroom. You can even get a memory foam mattress that conforms to your body for comfort and support. Furniture doesn’t have to just sit there like a rock. There is plenty of transforming furniture that can change size and functionality to suit your needs. For example, you can get expanding chairs that seat one when compact and that can pull out to seat several people like a bench. Transforming coffee tables can become desks or dining tables. 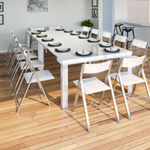 Other transforming tables go from a small dinette to a large table that can seat up to 12. There are many options for transforming furniture. The more you have of it, the more options you will have for your space. You can take up the least amount of square footage when the furniture is not in use, which will allow you to free up clutter and make your home seem bigger. You don’t have to live in a tiny home to take advantage of the same space-saving and organizational tips that make smaller living work so well. You can use these same strategies to get more out of the space you have, whether you want to make room for that home office or you want to be able to accommodate a guest room and an artistic space. Expand Furniture can help you do it with our range of space-saving furniture, including our stylish wall beds, sofa beds, transforming tables, modular storage, and more.